It has been another very busy, challenging and rewarding year for the group. The Committee reviewed and agreed the top priorities for the year at their first meeting and have worked very hard to ensure that we have given our commitment to them. I have therefore reported under each of these agreed priorities. 1. 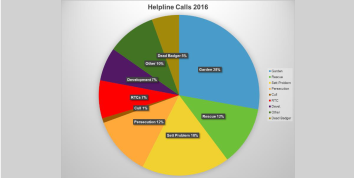 Helpline – response and rescue For the year 1st January to 31st December 2016 our 24/7 Helpline received 328 calls (last year 395). The number of calls relating to persecution and developments rose and this trend has continued in the first quarter of 2017. In addition, in the first year since the launch of our website, a total of 325 badger sightings (mostly RTC’s) and 126 new setts were recorded via our website and hundreds of emails have been responded to. I want to particularly thank Paul Cullen-James for helping to man the Helpline and all those experienced people who have willingly given up their time to help both badgers and people. March was the busiest month with 49 calls and a total of 92 calls were taken to end of March 2017.
a. Website and social media – we have continued to grow our presence on Facebook (2355 followers) and Twitter (4245 followers). My sincere thanks goes to Louise Matthews who does a fantastic job keeping our group in the public eye by sharing key stories and key issues in imaginative ways. b. Events and Talks – The group has been represented at a number of events including events run by Exmoor National Park Authority and the RSPCA and we have continued to support Secret World Wildlife Rescue (SWWR) at their events throughout the year. We have also been requested to give a number of presentations. For example, Paul kite and Paul Cullen-James were involved with a wildlife event at a School in North Cadbury and Mike Collins has presented on badger ecology and the badger’s interaction with man. Our General Meetings continue to follow the format of having presentations from different members which included Andy Parr on the rescue and release of badger cubs, Paul Kite on Badger RTC’s and Tristan Cooper on ‘Badger behaviour related to climate’. Paula Hewiston, Manager of SERC also presented on badger records held by SERC. c. Newsletter – In March 2017 we launched our first electronic quarterly Newsletter which we have also shared via our website. This format has made it much easier to produce and also share easily with everyone and I would love more contributions for our next Newsletter which will go out in June. We also made sure that those members who have not got email received a paper copy. 3. Roles and Responsibilities – We are extremely lucky to have such dedicated Committee members who continue to take on key responsibilities to ensure our group runs smoothly and continues to develop. In particular I would like to thank two people who have for many years given a huge commitment. Hazel Wood who looks after the group’s finances so efficiently and Paul Kite who organises the meetings and takes the minutes. I was delighted that Barbara Emery agreed to be co-opted onto the Committee to help with the organisation of fundraising events. My sincere thanks to everyone. 4. Training – we have continued to share our considerable expertise with less experienced members of our group and also with members of the Devon Badger Group and other badger organisations. I am delighted to say that we have now two more of our members who can carry out badger rescue safely and effectively thanks to the on-the-job, hands-on training from other experienced rescuers. Our training efforts for 2017 will target in particular the areas of badger persecution, badgers and developments and training on how to deal with badgers causing issues in gardens. 5. Badger Persecution – as I mentioned previously the number of calls and emails we have received relating to badger persecution continues to rise year on year. During 2016 a total of 39 incidents were reported 67% related specifically to badger setts, the majority of which were of sett blocking and 33% related specifically to badgers found with suspicious injuries, including snaring, suspected poisoning and being shot. A considerable amount of effort is given to following up every incident reported to us with the police, Natural England and also in the case of poisonings, Fera’s Wildlife Incident Unit. Sadly the resources within these organisations have been significantly reduced so it is difficult to obtain timely support from them. In addition, Police Wildlife Crime Officers are only able to devote a tiny percentage of their time to following up wildlife crime within their areas and being able to provide sufficient evidence to progress to a prosecution remains extremely challenging. 6. The Badger Culls – During the 4 years of the badger cull in West Somerset a total of 1792 badgers were killed and so far nearly 15,000 badgers killed across the 10 areas within England. Our badger group, together with other organisations under the banner of Team Badger, has continued to influence the Government and raise public awareness to this inhumane and unscientific Government bTB strategy. The Government held two public consultations, in particular the consultation in February 2017 on its proposal to carry on culling in the two original badger cull areas of West Somerset and West Gloucestershire by offering farmers and landowners a 5 year rolling licence. Our Group sent robust responses to both of these consultations and we offered guidance to you as members and also members of other organisations. I would like to personally thank all of those who took the time to take part in the consultations. Our group has continued to educate the public about these senseless culls and many of our members have taken part in peaceful and legal badger patrols to protect badgers during the culls. Sadly we believe there could be additional areas in Somerset and in other counties rolled out in 2017 and continued culling within the West Somerset Area. Badger culling is now the biggest threat to badgers in Somerset and the South West and we will continue to work with Team Badger and the Badger Trust to influence change and raise public awareness. 7. Fundraising and Finances – You will see from our financial accounts that we made over £400 from events and that our group remains in a good financial position with £4,596.60 in our working account (an increase in funds of just over £1,000) and £12,441.16 in our ring-fenced badger vaccination account. The funding we receive from you as members and also from members of the public is extremely valuable and allows our group to continue to deliver its key objectives. 8. Badger Vaccination – During 2016 sadly we were unable to offer badger vaccination due to a shortage of BCG vaccine. However, our badger vaccination team continued to keep in contact with the farmers and landowners of our vaccination sites to keep them updated. We were also successful in recruiting another site in Devon and we have been able to involve the Devon Badger Group in this process. I am delighted to say that we will be vaccinating badgers again in 2017 using an alternative BCG vaccine from a Canadian Company. We have been working closely with the Derbyshire Wildlife Trust’s badger vaccination team to progress badger vaccination this year and our team of volunteer Lay Vaccinators will be receiving additional training on how to use the alternative vaccine. 9. Collaboration and Partnerships – Once again we have worked hard on continuing to develop our collaboration and partnerships with other organisations. In particular with the RSPCA helping with badger cub releases and attending some of their events; SERC in two-way sharing of important data and helping to influence appropriate actions by developers; Somerset Wildlife Trust Specialist Groups by attending the quarterly meetings to raise the profile of badgers and the threats facing them; Devon Badger Group by sharing expertise and resources; SWWR by helping with badger rescue and release and responding to those badger problem calls which the charity cannot deal with; and finally with the newly formed Wildlife + Badger Care (formed by Pauline Kidner with a team of volunteers to cover the out of hours rescue which SWWR was no longer able to support) by supporting them financially so that they could create a badger and deer holding facility and by helping to respond to out of hours badger related calls. 10. Plans for 2017 – In my 2015 Report I stated ‘With the threat of further roll out of the culls, increased persecution, and continued high levels of development of green-field sites, the future for the badger is a real concern.’ Sadly this statement still applies but myself and the Committee, with your support, will continue to concentrate on these major concerns whilst raising public awareness, giving access to 24/7 help and advice, carrying on with our Badger vaccination programme and collaborating with others.